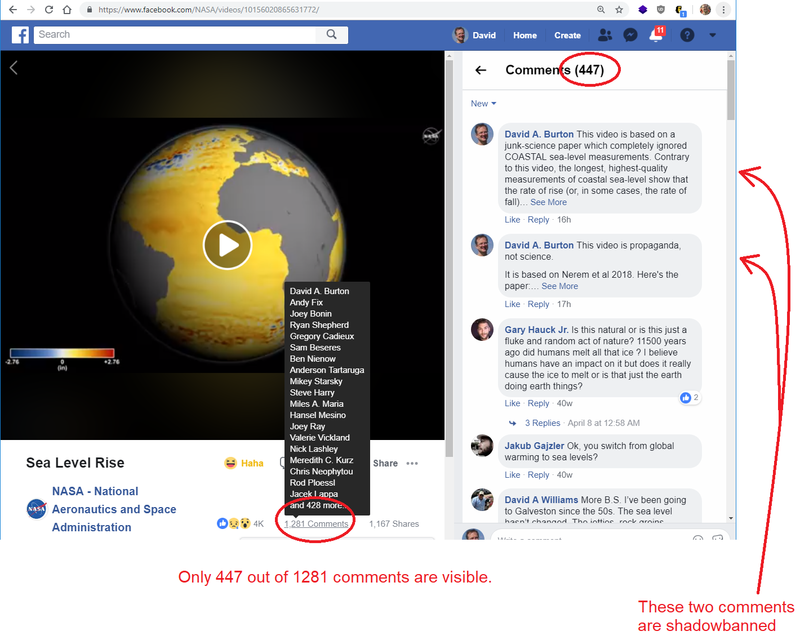 NASA's site doesn't support posting comments, but Youtube and Facebook do. That doesn't do much good, however, because on BOTH YouTube and Facebook, comments on this video are being selectively shadowbanned, which prevents correction of the misinformation in the video. This video is propaganda, not science. 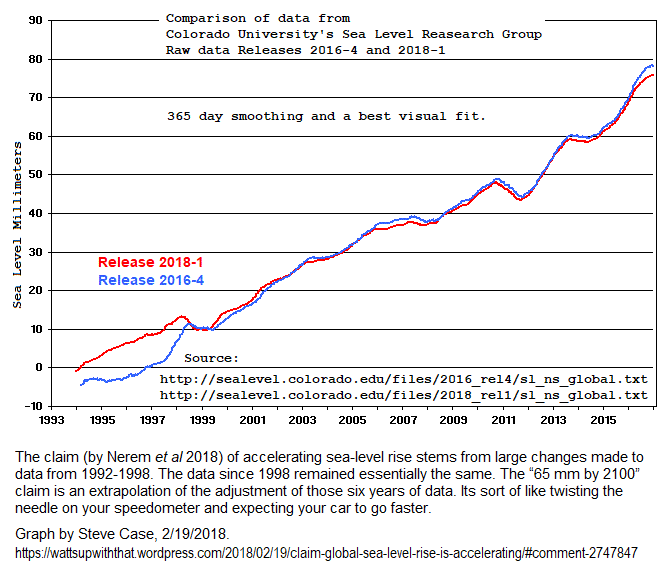 Nerem et al claimed to have discovered "acceleration" in the satellite altimetry sea-level data. 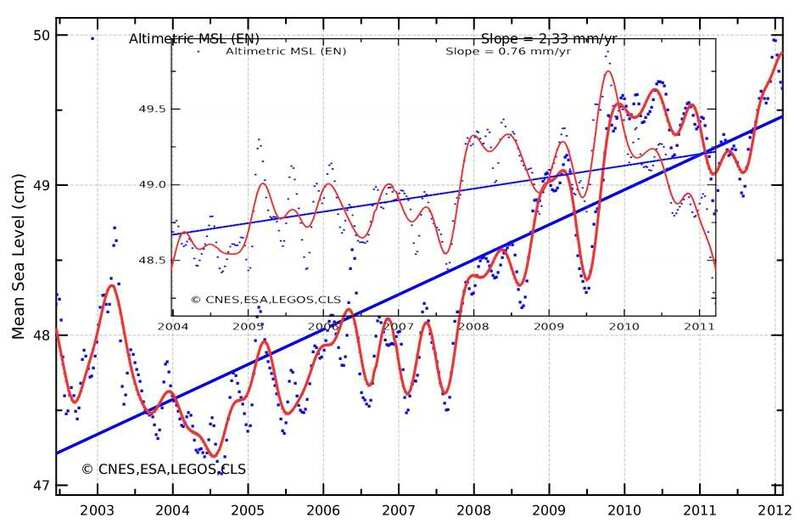 But when you read the details you discover that the "acceleration" they found was created by SLOWING the rate of rise of sea-level rise "measured" by Topex-Poseidon prior to 1998. Yes, you read that right: they "fixed" 20yo data, thereby creating the appearance of acceleration when the early Topex-Poseidon data is compared against the newer satellites' data (even though the new Jason-3 measurements show little sea-level rise, so far). Contrary to this video, the longest, highest-quality measurements of COASTAL sea-level show that the rate of sea-level rise (or, in some cases, the rate of sea-level fall) hasn't significantly accelerated in at least nine decades. 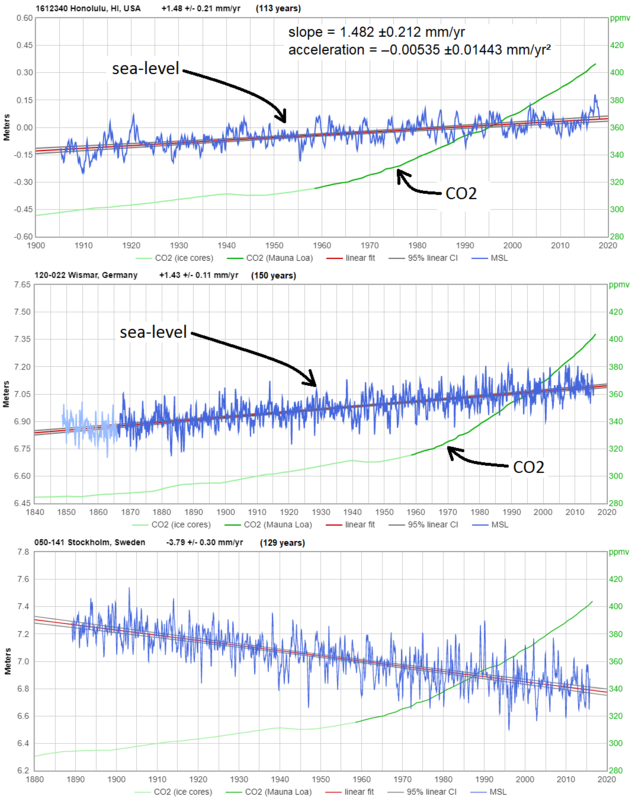 The first two graphs show very typical sea-level trends from especially high-quality measurement records, on opposite sides of the Earth (12 time zones apart, during summer). They're both at sites which are little affected by distortions like tectonic instability, vertical land motion, and ENSO. 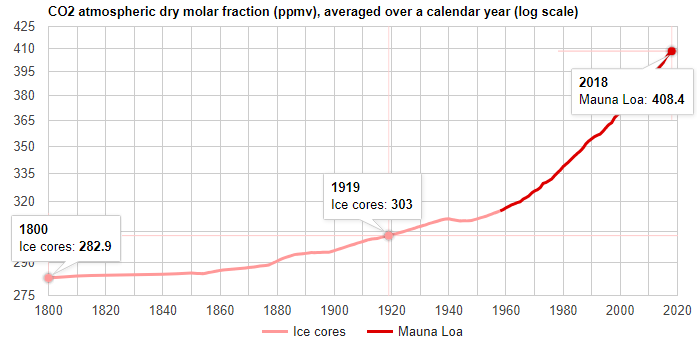 The trends are nearly identical, and perfectly typical: only about 6 inches per century, a rate which hasn't increased in more than nine decades. That is so tiny that it is basically negligible, because it is less than many common coastal processes, like salt marsh vegetation buildup, sedimentation, erosion, coral growth, and vertical land motion. In fact, in many places apparent sea-level rise is negative, because vertical land motion exceeds the rate at which the ocean is rising. What the numerous large revisions in satellite altimetry measurements of sea-level (and their inconsistency with the coastal measurements) demonstrates is how malleable and unreliable the satellite altimetry "measurements" of sea-level are, compared to tide gauge (coastal) measurements. There are many problems with the satellite altimetry data. 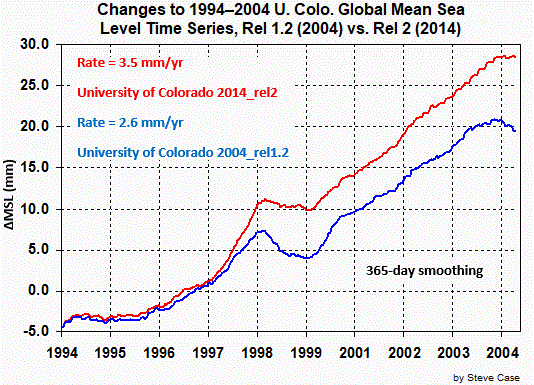 One is simply that satellite altimetry measures sea-level in the wrong place. The satellites cannot measure sea-level at the coasts, at all -- and the coasts are the only places where sea-level trends matter. Also, the satellite measurement records are extremely short. Their longest single-instrument measurement record is only about a decade. In contrast, many coastal measurement records (including Honolulu) are well over a century in length, and quite a few are over 1.5 centuries. Proof of the poor quality of the satellite altimetry measurements is to be found in the many revisions to already-measured "measurements." Trustworthy measurement data does not require endless revision and correction, long after it has been collected! The small graph is the "before" version. The larger graph is scaled identically. It was produced by the SAME group, using the SAME measurement data, from the SAME satellite -- and it approximately TRIPLED the reported rate of sea-level rise. Now, why on earth would anyone choose to use such low quality data, and completely IGNORE the vastly higher quality sea-level measurements from tide gauges, as Nerem did? When people cite low quality data and ignore high quality data, it's often sign of bias: they're picking the studies which come closest to confirming their prejudices. They're trying hard to find what they want to find, and ignoring contrary evidence. You see the same sort of behavior when people cite GRACE studies and ignore ICESat and ERS, w/r/t Antarctica ice mass balance. That sort of behavior is useful -- but mainly for identifying scientific work which you should not trust! That means we've done the experiment, and we've seen the result. The data show that an extended period of rising GHG emissions & levels has had no detectable effect on sea-level, and there's no good reason to expect that it ever will.